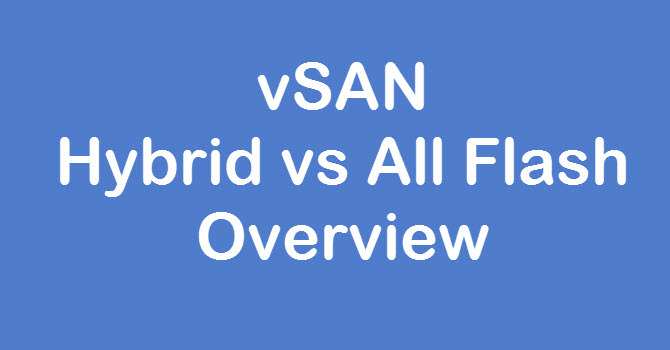 In this post we will be looking at how to view vSAN Capacity. Once you configure vSAN then you need to have look at the capacity and the values vSAN Provides. As we already know vSAN uses local disks of the ESXi hosts to contribute to the storage and make an logical pool of the storage for vSAN Datastore. When you configure vSAN on the cluster one datastore will be created “vsanDatastore”. In this vsanDatastore all your vSAN Data will be stored and you can also upload and view the vSAN Datastore. There are some of the values which also consumes the storage in the vSAN Datastore. In this post we will be looking at each of this values and how to view those values in the vSAN Datastore. To access the vSAN Datastore login to vSphere web client. Go to the storage tab and select vSAN Datastore as shown. 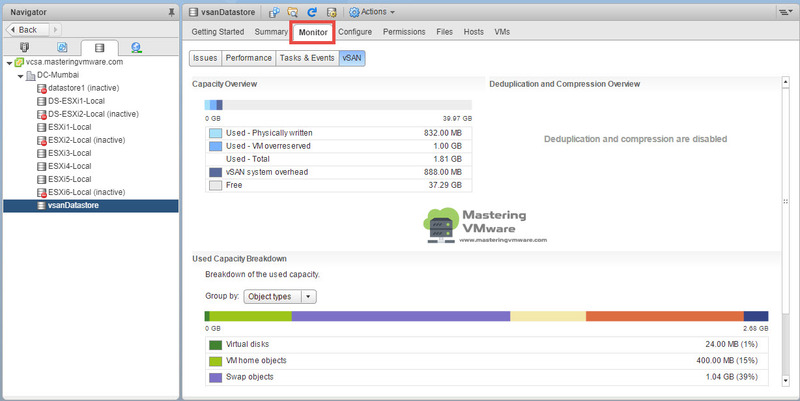 Once you select the vSAN Datastore you can see the total capacity, used storage and free storage in the summary section. If you want to check more detailed view then go to the Monitor tab and choose vSAN. It shows the total capacity of the vSAN Datastore, Used – Physically written, Used – VM overreserved, vSAN system overhead and free space on the vSAN Datastore. 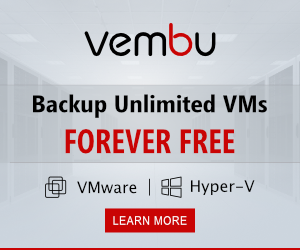 If you are not using Deduplication and Compression ad additional “VM Overserved” may appear. This is the result of object space reservations being set to larger than zero. If All policies are set to zero, this may still show capacity still reserved. In this, case it is often the result of object swap which defaults to 100%. As of now we have not enabled the Deduplication and Compression so it is not visible. It shows the values such as Used Before and Used After. You will also get to know about the total savings by Deduplication and compression and what is the Ratio used. 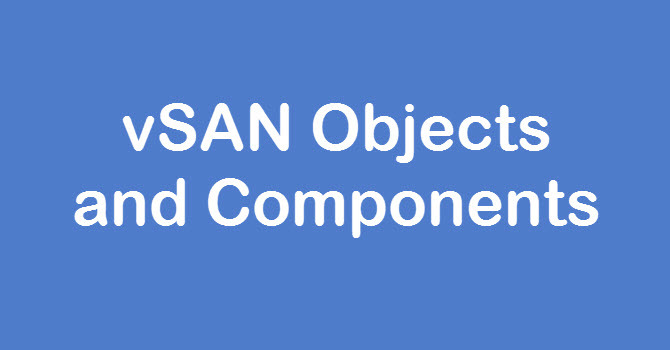 It shows the completed detailed view about the vSAN Datastore and the storage consumption by each objects. It provides the nice color representations for the different values so you can easily understand which object is taking more space. Let’s see each one of them one by one. Virtual disks: This will display the capacity consumes by virtual disks. Snapshot overhead will also show up here. VM home objects: This are the VM home objects such as Configurations, vmx file, nvram , logs that occupy the virtual machine home directory. 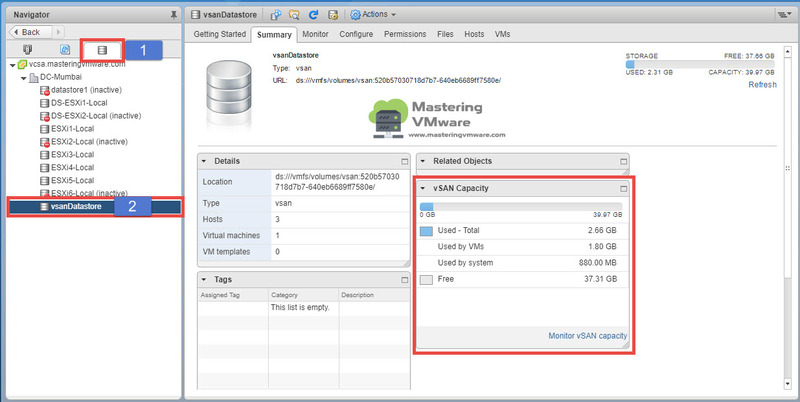 Performance and management objects: This is space used by the vSAN Performance Service. Note this will be a maximum of 255GB, although it rarely consumes more than 70GB. It is automatically created when the performance service is enabled. File system overhead: Overhead associated with the file system, deduplication, and compression hash tables, and other metadata. Checksum overhead: Approximately 5 bytes per 4KB block, this is a CRC32 checksum. Note Checksum is enabled by default but may be disabled per SPBM policy. iSCSI Home and Target Objects: This includes the iSCSI home namespace, it’s configuration files and LUNs that are provisioned. vMEM Objects: Associated with snapshots that include guest memory. Other: ISO’s, non-registered virtual machines, manually created objects fall into this category. 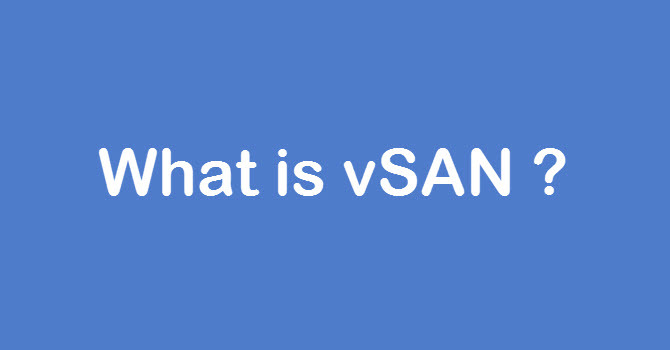 What is VMware vSAN ? How to Run vSAN Proactive Tests ? How to Create vSAN Storage Policy Step by Step ? How to Assign vSAN Storage Policy to the virtual machine ? 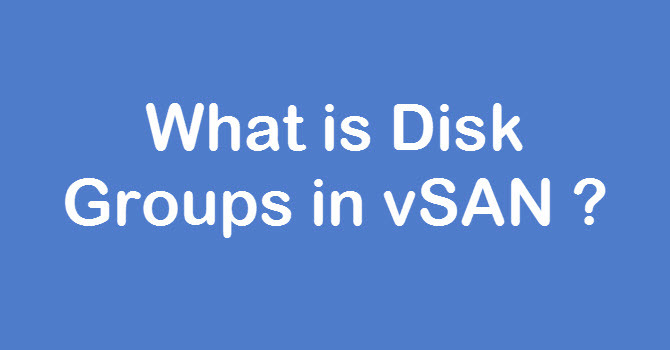 vSAN : What is Disk Group ?